Allie Bear's Long Ranch Ropes are the working ropes tested and used by real buckaroos. This is the place for you to order those special ranch ropes so popular in the Buckaroo country of the Great Basin and throughout the west. These ropes give you the edge you need when roping cattle and horses for a living. You can order your preferences in rope diameter, length, lay, material, and honda and have the custom ropes delivered to your front door. Full coils of rope are also available for the rancher or roper who cuts and ties their own ropes. If you rope for a living or rope for a pastime, you need to use one of these custom ropes. Allie also designs custom silver bits & spurs. Allie Bear was a previous owner of J.M. Capriolas and Garcia bit and spur company in Elko Nevada. She still deals with the same craftsmen that make the Garcia - Elko Nevada stamped bits and spurs. 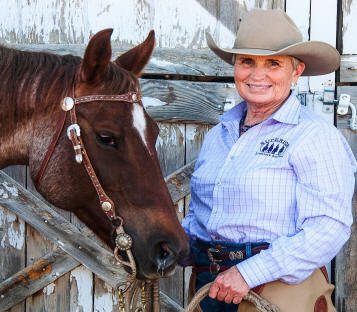 She designs custom event silver trophy bits and spurs and designs her own line of bits and spurs for horse people. Her customers range from working cowboys to high-fashion riders dazzling the horse show scene. Let Allie's silversmiths make your rodeo or show event trophy silver bits and spurs. Design your own silver pieces or let Allie help make your dream a reality. She will then assign the project to one of the talented silversmiths she works with and provide you with a quote. We are also pleased to be able to bring you these outstanding horsemanship and collector's books.